Choose from a variety of invitation styles to honor any and all occasions from Save-the-Date, Shower (Bridal & Baby), Birthday, Christening, Graduation, Birth Announcement, Retirement, Anniversary, Bereavement. Paper, Packaging & Panache proudly features albums from Crane/William Arthur, Kleinfeld, Embossed Graphics, Stacy Claire Boyd, Sweet Pea, Bonnie Marcus, Birchcraft, and Carlson Craft. 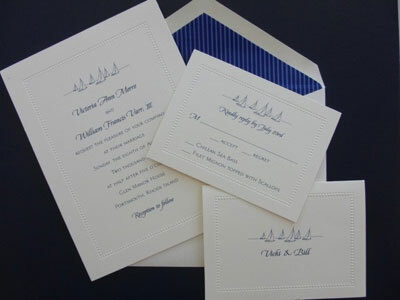 Printing choices include engraving, letterpress, thermography, digital and flat. Paper, Packaging & Panache also stocks a wide offering of imprintables and papers for all of life’s occasions. They can be printed in-house with your choice of ink color and typestyle. They may also be purchased to print at home or office. Calligraphy referral service also available.